After having rigged Cow over winter tour, I was eager to return and explore a bit more of Easegill. Having been told that Pippikin was a great trip, our intrepid trio were the first to head off, as we had the longest walk to our cave, a walk which for me involved slipping over in the snow numerous times and effectively crawling up the side of the hill. However, spirits were high and it wasn't very cold at all. Pippikin was indeed a very fun trip. It was fairly easy caving, but with lots of interesting (read: twatty) features and variety. And because, we came out through Mistral, it meant that there was no prusicking up, which was a relief, as some of the pitches were pretty tight, although all were pretty short. One in particular I got stuck at for a while, with my crotch holding me up against the wall and my hand unable to reach the handle of my Stop (maybe finally time to switch to a 'Go'). However, the majority of the squeezes were less of an issue for me than for Jonny, who enjoyed a lot of heavy breathing as he attempted to get through a particular squeeze with his croll getting stuck against the wall. Quite frighteningly, often these squeezes seemed to come out directly over a big drop. One involved sliding down feet first on your front, with a metal stemple that you cannot see below you that you need to put your feet on. You then need to stand on that stemple and rig your descender as the pitch is directly below, and head under. I think the book described this bit as 'acrobatic'. Another part involved standing on a stemple and having to head backwards into a narrow passage slanting upwards feet first, desperately trying not to slide head first down into the hole below. Soon enough, we reached the obligatory stream passage, and onwards to a quite impressive chamber, the Hall of Ten. After passing through Dusty Junction, Andy gave Jonny the task of finding the way out, remembering a time when someone had taken eight hours to find their way towards the exit. With the sage knowledge of always bearing right, Jonny and I went on, making one slight error in missing an arrow scratched on the roof of the passage. And so we were out, at the time of half past two. 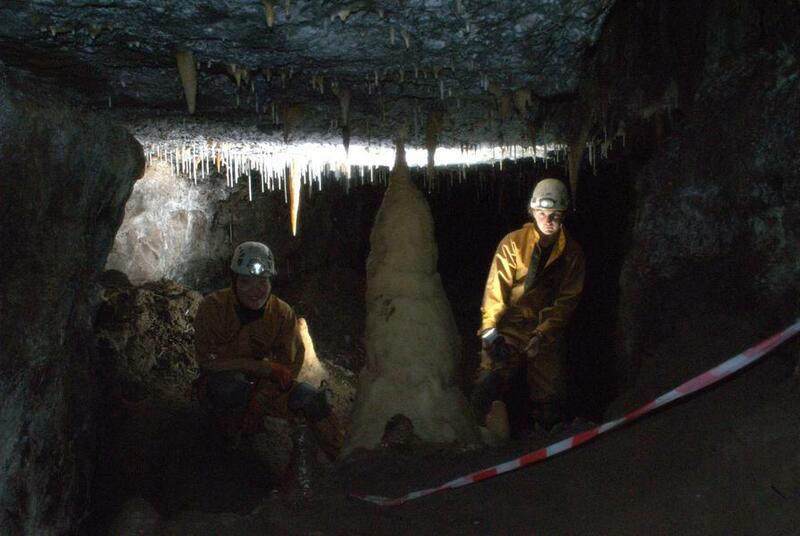 An afternoon drinking tea or more caving? We decided to head for Wretched Rabbit, where Clare, Su et al had gone. Ditching our SRT gear at the entrance, it was not long before we encountered the reduced gang of Clare, Su and Kate, who had already done quite a lot of caving by checking out five other entrances which were not in fact WR, but were pretty nasty. The six of us continued into WR, with five or six climbs assisted by thick ropes particularly fun. These were followed by quite a lot of snaking narrow passage. We decided to make our ultimate target Easter Grotto, although we were slightly puzzled by the way on, and ended up reaching the Grotto via a way that was unfamiliar to us all, a really pretty stream passage surrounded by loads of formations. Easter Grotto was then but a couple of short climbs up away, which although there was a hand line, where pretty difficult; thankfully Jonny stayed below to guide our feet and hands as we headed up. Kate provided a bit of excitement as she ended up dangling, hanging onto the rope with her hands, screaming for Jonny. Despite this, Easter Grotto proved well worth visiting. Although I have been there once or twice before, the spectacle was still impressive. We then proceeded to make our way out of the cave, with little difficulty except for a bit of route finding. The climbs near the entrance appeared daunting, with very few obvious hand/feet holds, but it was actually fairly easy to pull yourself up. With beer in our bellies, we headed back to Bullpot, annoyingly far away.